While teens and young adults have been competing in pageants for many years, a beauty contest for children is a relatively new phenomenon. These pageants can be good learning opportunities, but it's important to keep in mind the potential drawbacks as well. Is a Beauty Contest for Children a Good Idea? Every mother thinks her child is adorable, but there are many factors to consider before you decide to enter your daughter in a beauty contest for children. Pageant participants learn grace, poise, self esteem, and the ability to remain calm under pressure. These are skills that will serve your child well regardless of what she chooses to do in the future. A child who is interested in a career in acting or modeling may find that pageant participation offers great exposure. For example, before becoming an award-winning actress, Halle Berry was crowned Miss Ohio and Miss Teen All-American. Many pageants for children offer college scholarships as prizes, providing a good way to save for your child's future educational expenses. Pageants can be a good bonding experience for families, offering the chance to travel, socialize, and spend time together. Although some children are able to handle competition well, others are not. For sensitive kids, failing to place in a contest can be a serious blow to their self esteem. For young girls, who are already under great societal pressure to conform to a specific appearance standard, a beauty contest for children may give the message that looking pretty is a goal that must be obtained by any means necessary. Girls who participate in pageants must be watched carefully for any potential signs of an eating disorder. Participating in pageants can be very expensive. In addition to entry fees, you'll also need to pay for outfits, hair, makeup, jewelry, photography, and travel expenses. It's important to consider carefully whether or not you have enough room in your household budget for this expense. If you have more than one child, the attention the pageant participant receives may aggravate issues with sibling rivalry. This is most common in homes where siblings do not have their own special extracurricular activities to enjoy. 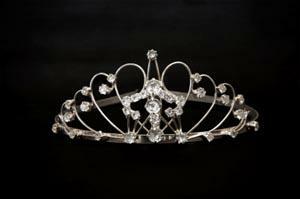 Locate pageants in your area that your child is eligible to enter. Pageant Center is a good place to begin your search. Complete the entrance requirements for the pageant of your choice and provide payment for all necessary fees. Select your child's pageant clothing. Many pageants for children have a dress code to help eliminate outfits that may be construed as too provocative. Look for hair and makeup ideas. Pageant Web sites may help you find ideas. LoveToKnow Makeup also has tips for applying stage makeup for the competition, although you'll want to keep in mind that children usually don't wear as much makeup as older pageant contestants. Practice! While some families may choose to hire a professional pageant coach, others simply practice answering questions and performing their talent routine in front of family and friends. Search for tips from previous pageant winners to learn more about what to expect on the big day. Although many of the tips are geared towards teens and young adults, 101 Beauty Pageant Tips has some helpful advice for children's contests as well. When it's time for the competition, make sure your child knows to relax and have fun! After the event, go out for a special dinner to celebrate. Even if your child doesn't place in the competition, she still needs to know that you're proud of all she has accomplished.